Do you wish to record a video on iPhone? It is always great and fun. The iPhone has an amazing camera with extraordinary features. Apart from the normal recording mode, with the coming of iPhone 5s, you can also record videos in two other modes. They are iPhone slow motion and iPhone time lapse mode. The slow motion video iPhone captures most attractive videos, especially for portrait and flowing water. Let’s explore the slow motion video iPhone feature and learn how to record slow motion videos. Slow motion video, a feature that is offered only by the high-end expensive cameras is now available with the iPhone 5s. It is easy to use, affordable, and sheer fun. Here are the steps to record iPhone slow motion videos. Capture Screenshot - You can capture stills while shooting iPhone slow motion videos. Tap on the white button at the left bottom corner of the screen and a high resolution snapshot is automatically saved in the Camera Roll folder beside the recorded video. Supported Slow - Mo Shooting Modes- Do you know the slow motion recording modes supported by iPhone? iPhone 5s only can capture 720p at 120 FPS. iPhone 6/6 Plus/6s/6s Plus, iPhone 7/7 Plus can capture 720p at 240 FPS. iPhone 8/8 Plus and iPhone X can even capture 1080p HD at 240 FPS. Space used by slo-mo video - It is vital to know that the iPhone 5s onwards iOS devices record slow motion video at 120 frames per second (fps). If you record slow motion video at higher frame rates, it takes lesser space than 120fps video. The slo-mo video recorded at 1080p resolution at 120 fps uses approximately 375 MB per minute storage space and slow motion video iPhone resolution of 720p at 240 fps uses approximately 300 MB per minute. Is slow motion video from normal video possible - A higher frame rate than normal is required to record a slow motion video., Playing a slow motion video to normal is possible but the reverse is impossible. You get a jerky video with frames jumping here and there when you try to watch a slow motion video from normal. It appears as a series of still snapshots rather than a constant video. In view of iPhone doesn’t support converting slow motion videos, we can recommend two apps for making slow motion video of normal speed. 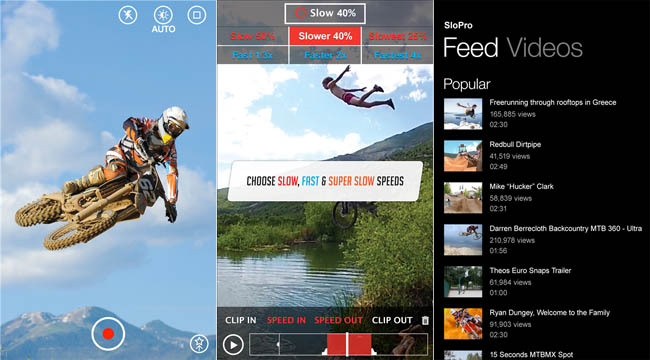 SloPro is a free tool for creating iPhone slow motion videos. Start recording instantly post launching SLOPRO. Once you are done, select the video from the library and tap the red colored edit button at the top right corner. Next, highlight the part of the video you wish to slow down using the clip out and clip in button. Now, to set the slow motion options, it is recommended to select between 500fps and 1000fps. You can slow the video by 25%, 40%, or 50%. Once all set, tap Render and select the Optical Flow to get the best parameters. Finally, save So if you liked SloPro, get the full version within the app.the video and share it with your friends on Facebook and YouTube. The free version of the SLOPRO carries watermark which is indeed a drawback. Get the full version of the app to avoid such issues. The free version of iPhone Slow Motion Camera Extreme offers 10 seconds of free recording time along with watermark clippings. The paid version has no such restrictions. Although there are not much editing options available, you can select a video from Camera Roll or record a high quality video, slow the speed of the video by 25%, 50% or 75% by clicking on the 50% sign. To add a song to your iPhone slow motion video movie, click on the Music sign. Once you complete editing, tap on the share button and export the slow motion video directly to the social networking platforms to share it with your friends. If you wish to give a slow motion effect to a normal iPhone video, you may even try the Filmora on your desktop which is a great editing software. In just a few simple clicks you can get a professional quality high resolution iPhone slow motion video. It is a great tool which makes your video editing easy, creative, and trendy.